The west coast of Wisconsin is not typically thought of as a hotbed of alternative reggae music. However, TUGG, hailing from La Crosse, WI has done an amazing job channeling tropical grooves and breezy melodies and has quickly become a top draw in the Midwest and beyond. Coming from a state known more for the Green Bay Packers, cold weather, and cheese, they boast an impressive resume of rubbing shoulders with reggae heavyweights. From shows with Barrington Levy and Slightly Stoopid to recording tracks with the likes of Pato Banton, Josh Heinrichs, and Outlaw Nation, TUGG continues to prove why they are a fast rising star in the alternative reggae scene. All of the bands last 3 albums have debuted in the Top 50 of the iTunes Reggae Chart. Their most recent album, Home Brew EP went to #2 and spent 3 weeks in the Hot 100 iTunes Reggae Album Chart. 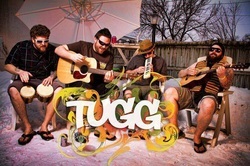 Last Spring TUGG was asked by The Dirty Heads (EMG) to provide support for a string of shows in the Midwest on their first ever headlining tour, which included a sold out show at the House of Blues-Chicago on St. Patrick’s Day. It is often said that to achieve greatness you must first surround yourself with greatness. If that is any indication about TUGG than their future is looking good. In the last few years alone they have been fortunate enough to share the stage with: Slightly Stoopid, The Dirty Heads, Cage the Elephant, SOJA, Barrington Levy, Pepper, The Aggrolites, Tribal Seeds, Ballyhoo!, Iration, The Movement, Mad Professor, Karl Denson, Rusted Root, Pato Banton, The Ziggens, Josh Heinrichs, New Politics, Pacific Dub, Tech Nine and many more.